Police in Berkeley are searching for two suspects in a robbery and shooting early last month, and they released new surveillance video Wednesday night in an effort to identify the two men. The robbery occurred about 9:30 p.m. Dec. 5 in the 1900 block of Vine Street, and police just released the surveillance footage as they ask the public for help in finding the suspects. Police said a man parked his siver sedan on Vine Street, just off Martin Luther King Jr. Way, and as he exited his vehicle, two men are seen in the video approaching him from behind and grabbing his backpack. The man fought back, and the robbers then opened fire, hitting the victim in the leg, police said. Police in Berkeley are searching for two suspects in a robbery and shooting early last month, and they released new surveillance video Wednesday night. The 32-year-old victim was taken to the hospital and was expected to be recover, police said. One suspect is described as a black male, age 20-30, with a large build, wearing a dark hooded sweatshirt. The other suspect is described as a black male, with a thin build, wearing a black hooded sweatshirt. 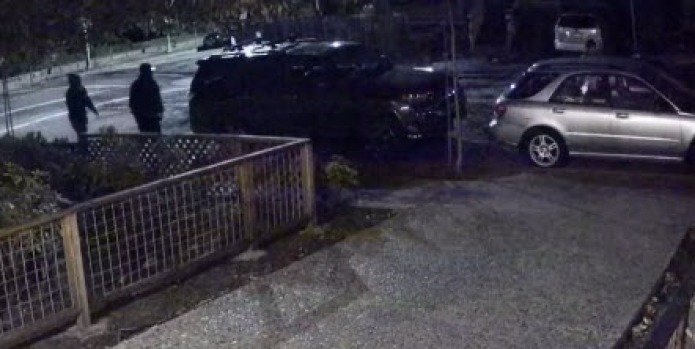 In the video, it appears the suspects drove to the area in a newer model white sedan, possibly a Chevy Impala, police said. The crime occurred in a quiet neighborhood near upscale restaurants on Shattuck Avenue on Berkeley's north side. Polce are concerned about a trend in such backpack robberies. One man who declined to be identified said he was a robbery victim near the UC Berkeley campus a few days after the robbery on Vine. He said he was badly beaten because he fought to hold onto his computer. "It’s a trend in rising violent crime, a lack of preparedness and a lack of care by the city to defeat this," he said. Police said they are working to solve the robberies and are warning the public to be on alert.